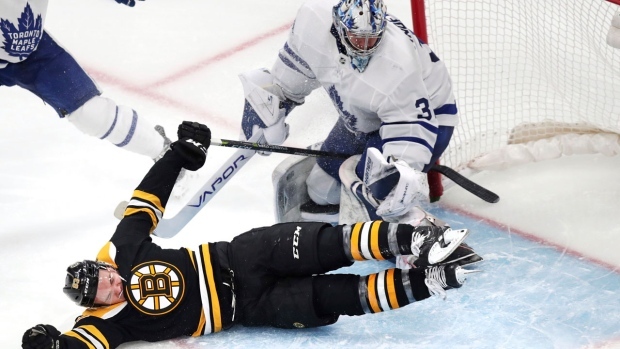 BOSTON -- Mitch Marner scored twice, including one on a short-handed penalty shot, as the Toronto Maple Leafs downed the Boston Bruins 4-1 on Thursday to grab a 1-0 lead in their best-of-seven first-round playoff series. Boston, which won three of the teams' four meetings in the regular season, beat Toronto in seven games at the same juncture of the last spring's playoffs -- including a four-goal third period in the decider that turned a 4-3 deficit into a 7-4 win. Boston continued to push, but Andersen and the Leafs held their nerve before Tavares iced it into an empty net for Toronto's first victory in a Game 1 in 5,846 days -- when Marner was five years old.